My friend Diane Rauscher-Kennedy has been in the papers recently, for two reasons. The first is because she has an exhibition of her paintings in the café of Galeries Lafayette in Montpellier for two months. This is an annual event and is repayment for the work she does for the rest of the year finding bright young local artists and exhibiting their work, free, on two-month rotations. Lafayette Restaurant thus has its walls beautifully decorated all the year round at minimal cost, and unknown but talented artists are able to exhibit their work to a sizeable audience. This charitable work has a certain cost, however, and Diane has been paying it for several years now, to the extent that she has decided the time has come to formalise her efforts into an association, which brings us to the second reason for her recent publicity. 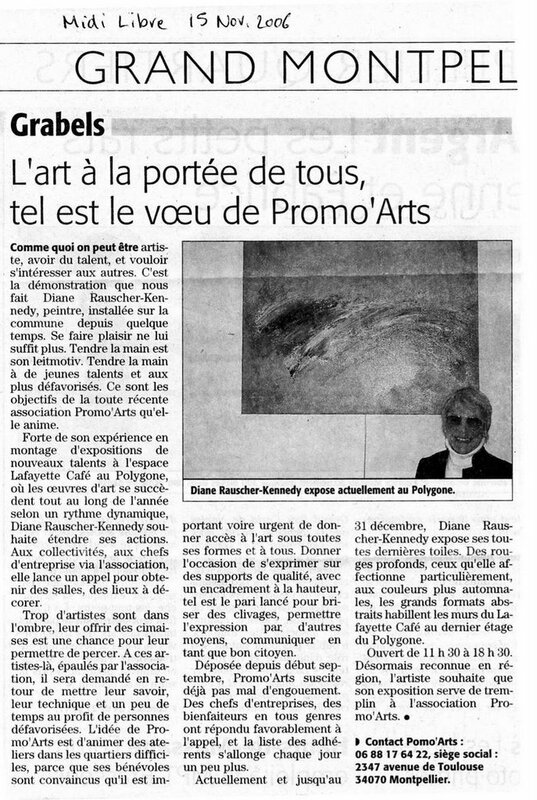 She has started up Promo'Arts as, what the French call, an association 1911. This means it is non-profit making, but that expenses can be reimbursed and even a salary paid to enable her to spend more time expanding the assoc along the lines she has planned. One of the ideas is to incorporate all her artists into the assoc as members and then to send them into the community, to under-priviledged areas for the benefit of les jeunes. They will start up workshops to encourage local youth to be creative on canvas rather than on someone's garden wall or car. At present, the assoc needs both members (20€/year) and membres bienfaiteurs who give a more substantial amount. Many talented young artists have been helped along the road to renown thanks to Diane. If you would like to help her to help even more, do contact her on 06.88.17.64.22. It's good to see your friend and neighbour "ng" getting the recognition she deserves. Oh ED dear, what a super surprise...I open up your Blog to have my "just off to shower-then-off to bed treat", same ritual nearly every evening, quick supper then on to your Blog.....after a really hard working day.....and there is me looking (I?) looking back at myself and your description of the Association etc. Thanks so much, I need all the help I can get....especially as I am now going to try and get ateliers going for poorly and handicapped children too. Some real fun with proper pro equipment for them. As I read your Sunday blog first - why don't we see how we could include intimate little concerts for them too? My left out youngsters could also play their kind of musc, but have a go at listening to ours...super idea of a way of learning about each other. 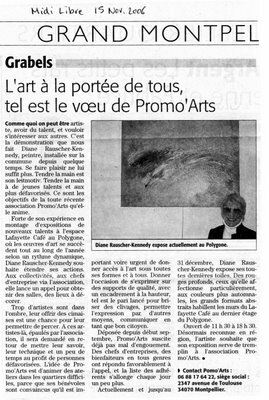 That's why I called my Association "Promo' Arts" - so as to be able to include sooner or later all forms of art and culture. Being left out, or excluded is not just food and housing. It's having a decent access to soothing things like painting and music - but in a ludique way and not with an academic approach. The very thought of painting whilst listening to Mozart makes me feel good all over...and the first of the series of "Rouges", which was done this summer was called "Bolero" and painted whilst listening to Ravel loud enough to wake the dead! Thank you dear pour un moment de douceur dans ce monde de brutes.